NBA: Spurs to retire Tim Duncan, no 21 in a special postgame ceremony. 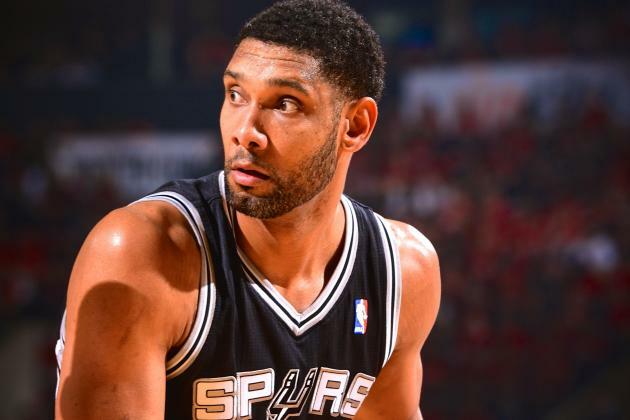 The San Antonio Spurs today announced that they will retire Tim Duncan's No. 21 jersey on Sunday, Dec. 18 when the Silver and Black host the New Orleans Pelicans at 6 p.m. CST. A special postgame ceremony honoring Duncan will take place on the AT&T Center floor and will be broadcast live on FOX Sports Southwest and the FOX Sports Go app.Duncan will become the eighth Spurs player in franchise history to have his number raised to the rafters, joining Bruce Bowen (12), Sean Elliott (32), George Gervin (44), Avery Johnson (6), Johnny Moore (00), David Robinson (50) and James Silas (13). 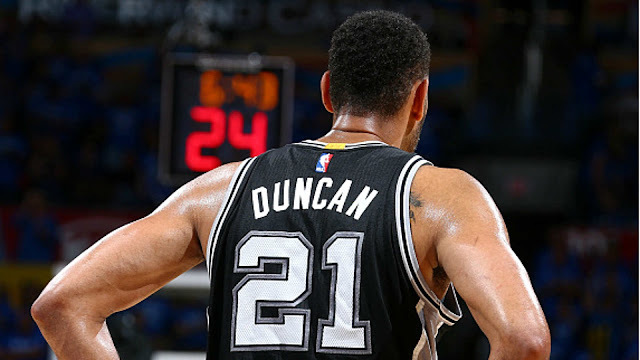 Originally selected by the Spurs as the first overall pick in the 1997 NBA Draft, Duncan guided San Antonio to five NBA championships and posted a 1,072-438 regular-season record, giving the team a .710 winning percentage, which is the best 19-year stretch in NBA history and was the best in all of the NBA, NFL, NHL and MLB over that time. He helped the Spurs reach the playoffs in each of his 19 seasons and became the only player in league history to start and win a title in three different decades. The Silver and Black won at least 50 games in his last 17 seasons, the longest streak in league history, and posted at least a .600 winning percentage in each of Duncan's 19 seasons, an all-time record for most consecutive seasons with a .600 win percentage in the four major U.S. sports. In his final season with the Silver and Black, Duncan became just the third player in league history to reach 1,000 career wins, as well as the only player to reach 1,000 wins with one team. 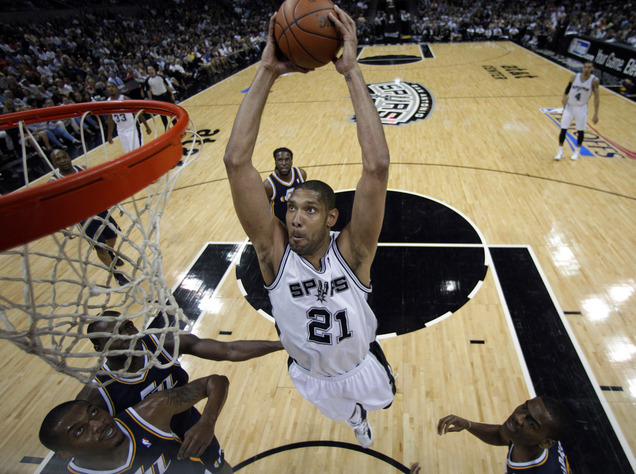 He helped the Spurs to a franchise-best 67-15 record and also became one of two players in NBA history to record at least 26,000 points, 15,000 rebounds and 3,000 blocks in his career (Kareem Abdul-Jabbar).Duncan totaled 15 All-NBA Team selections (tied for most all-time) and 15 NBA All-Defensive Team honors (most all-time), garnering both honors in the same season 15 times, the most in league history. The 1998 Rookie of the Year was named NBA MVP twice (2002, 2003) and NBA Finals MVP three times (1999, 2003 and 2005). Along with teammates Tony Parker and Manu Ginobili, Duncan is part of the NBA record for most wins by a trio in both the regular season (575) and postseason (126). Duncan and Gregg Popovich have the most wins by a player-coach duo in NBA history (1,001) and the Spurs forward finished his career in San Antonio as one of just three players in NBA history, along with John Stockton and Kobe Bryant, to spend 19 seasons with one franchise. A limited number of multi-game ticket plan options are available by calling 210-444-5050, while tickets can also be purchased through Ticketmaster's verified resale marketplace, NBATickets.com. More information on Duncan's jersey retirement will be announced at a later.